Another competition another third place! 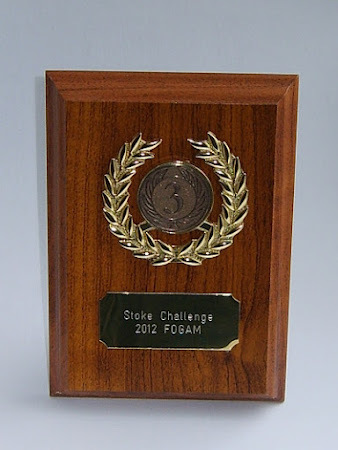 This time it was in the 650 point singles competition held at Stoke Challenge on Sunday, 15 July 2012. However, I’m not getting carried away: I was tied for third place and was awarded the trophy on “count back”. Having said that this was a strange trio of games as will become clear. I had hoped to fight 1 or 2 games on my terrain of choice (steppe) but played two games in hilly terrain and one in the mountains. Just great for a cavalry army. The main problem is I turned up expecting to play two games to be told there were in fact three games to be played. Note to self: must read competition rules more closely. Ade Ball (Alumwell) & I fought out an absorbing 10 all draw with few casualties on either side which was strange considering the fire power Ade had. The game was also notable because it was the first time I had used a flank march in earnest. Thankfully, it arrived fairly early on after 4 or 5 bounds and to great effect turning Ade’s left flank but I lost a victory point because a battle group of light horse refused to arrive. 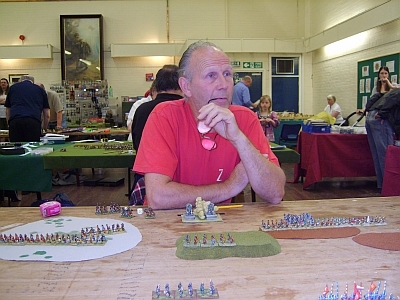 Ade was a great opponent with a smashing, relaxed attitude and although I had more victory points that he did it ended a draw as he had a 30% larger army (13 vs 10 battle groups). This result proved crucial as the tie for third place was decided on count back using the scores against Ade who was the common opponent. The eventual winner, Robert Taylor, added to his points total in my second game. Out of respect for Rob, who organised the FOGAM competition, I have not posted any of the photos I took as they are badly out of focus. I’d rather forget this game. I had one chance to break through on my right flank but Rob’s far too good a player not to respond and he prevented the breakthrough. As Rob went on to win the competition I suppose 5 points wasn’t too bad. The game was ruined by having to play on a rough piece of chip board and I have the scars to prove it. As a consequence the game wasn’t pretty to look at. However, the biggest problem was when the blokes from the host TA Centre decided to run an auction and raffle. So for what seemed like forever we were harangued by incompressible shouting at parade ground volume. It did not help my concentration, or mood, at all. Oliver Hutt (sorry I forgot to take a photo) fielded lots of offensive spear in a strong corner position with one flank covered by a coast line and set about awaiting the arrival of his flank march (which never did arrive). In the meantime I was able to pour bow fire into the end unit anchored on his baseline until it fragmented. I then declared a charge with my light horse. Any failure would take out three battle groups and expose the flank of his corner position. I can’t remember if Oliver took the test but it was at this point Oliver resigned. 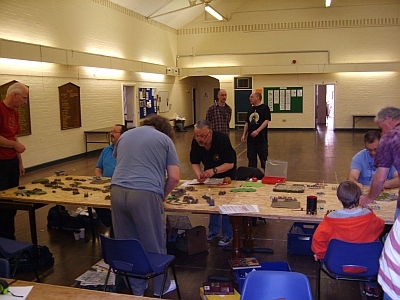 In this photo you can clearly see the bare tables used for the FOG games. The rest of the show was much better presented and Will McNally has posted lots of photos of the day in all it’s splendour. 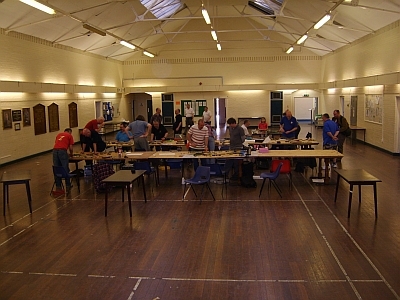 Here’s the hall as the FOG players finish their third games after everyone else has gone home!